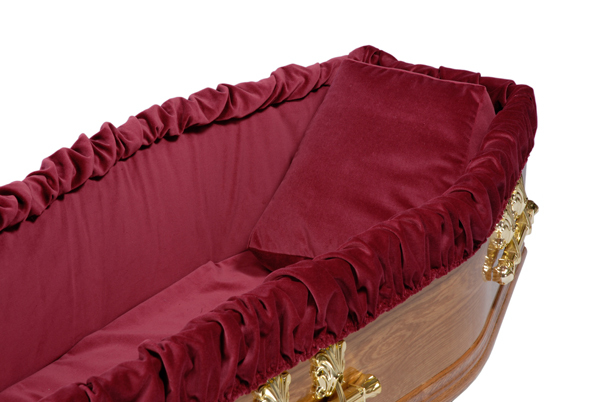 A soft and sumptuous interior manufactured in 100 % Cotton Velvet. Comes complete with a padded mattress, padded side pieces, elasticated frill and a padded pillow. 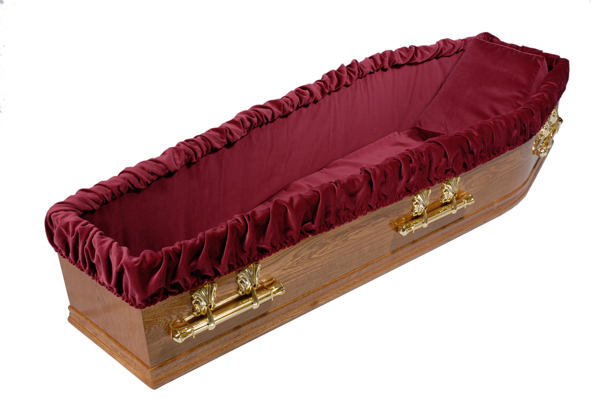 It is available in Burgundy and Navy. 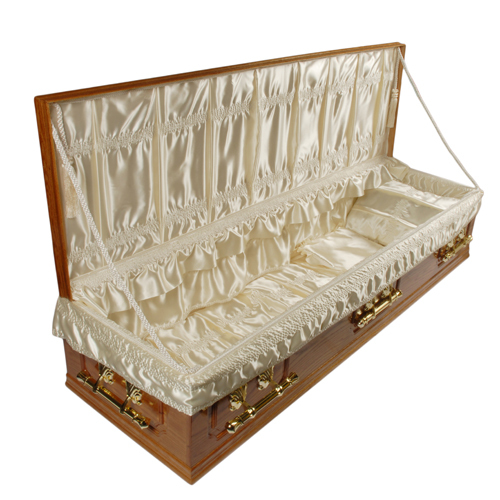 Click here to view a video of our Velvet Interior being fitting into a coffin. 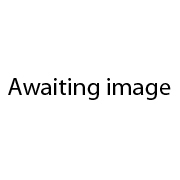 (When you have finished viewing the video, press the back button to get back to this page). 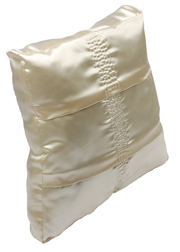 Satin suite with quilted mattress, Satin suite with quilted mattress and 9" frill attached or Taffeta suite with quilted mattress. All options include a pillow. 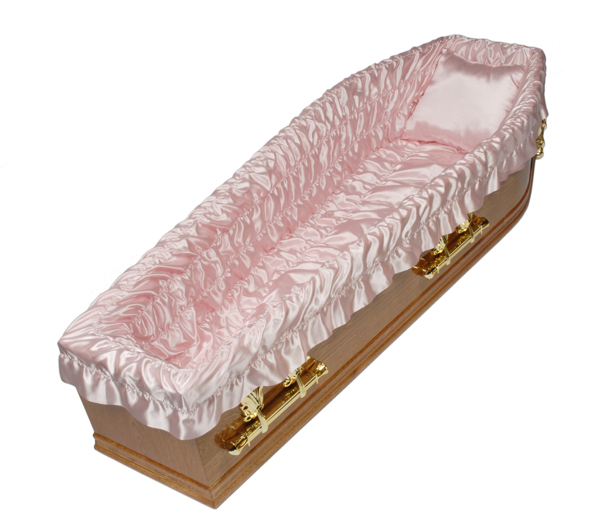 Available in the following colours: White, Pink, Blue, Cream and Oyster. 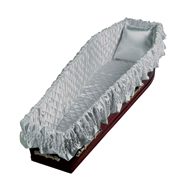 Top quality full satin suite for caskets. 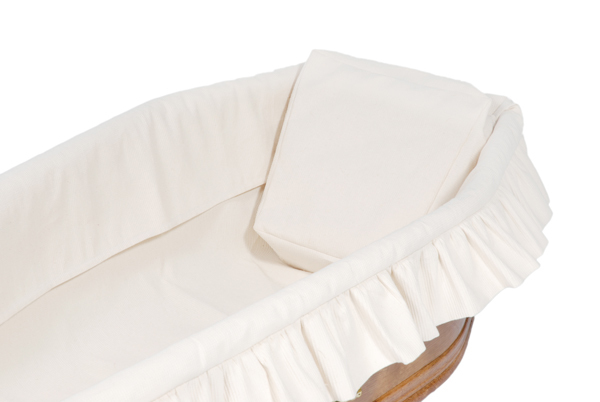 Comes complete with gown, padded pillow, 12" frill, puff ruffle, padded mattress, coverlet, interior lid piece all in satin. Cords and tassels are available also if required. White, Blue, Pink, Cream, Lilac, Maroon, Navy, Oyster, Peach, Red, Silver/Grey, Mint Green and Bottle Green. Special Offer Prices for orders of 3 or more suites. A high sheen satin elasticated interior suite complete with matching pillow. Available in 2 sizes - small and large to fit all coffins. White, Pink, Blue, Cream, Lilac, Maroon, Navy, Oyster, Peach, Red, Silver/Grey, Mint Green and Bottle Green. A high quality satin interior suite complete with matching mattress and pillow. Full satin coffin suite. 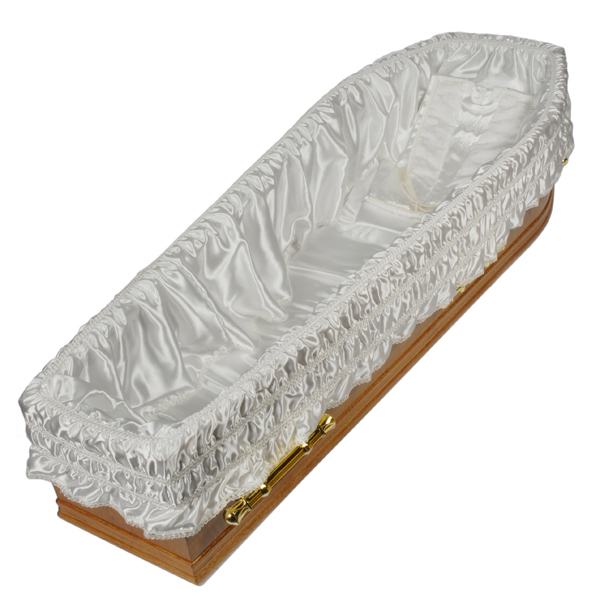 Comes complete with satin gown and satin interior lid piece. Value stitchbonded side sheet set complete with separate frilling. Sold in boxes of 10 sets. Available with a 6" or 4 1/4" frill and in the following colours: White, Pink, Blue, Cream and Oyster. 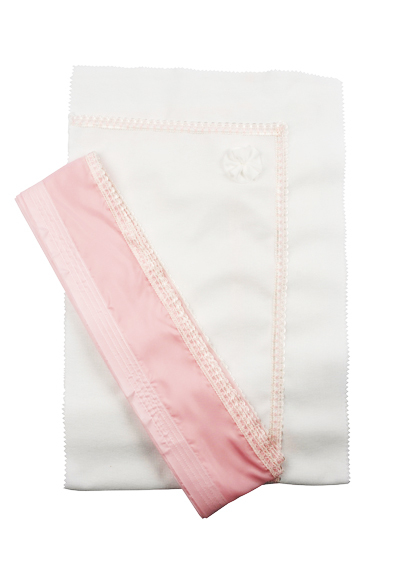 Taffeta side sheet set complete with separate frilling. Sold in boxes of 10 sets. 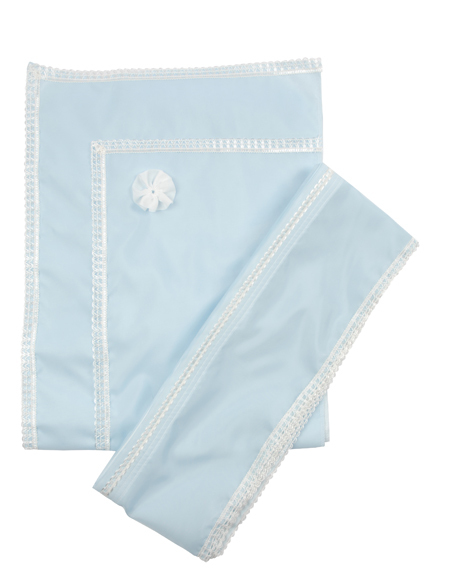 Satin side sheet set complete with separate frilling. Sold in boxes of 10 sets. 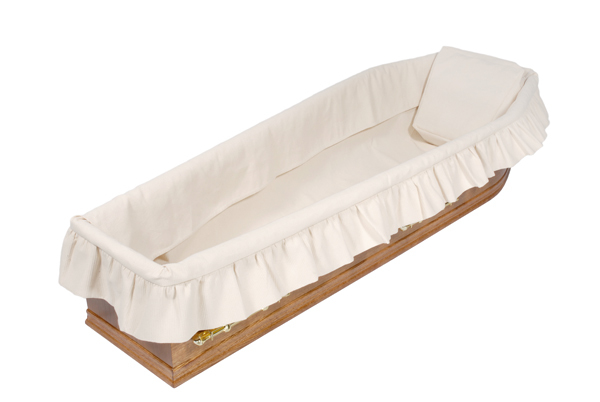 Available with a 6" frill and in the following colours: White, Pink, Blue, Cream and Oyster. 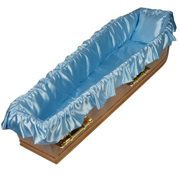 Padded taffeta coffin pillow, sold individually. Available in the following colours: White, Pink, Blue, Cream, Navy, Maroon, Lilac, Oyster, Peach and Bottle Green. 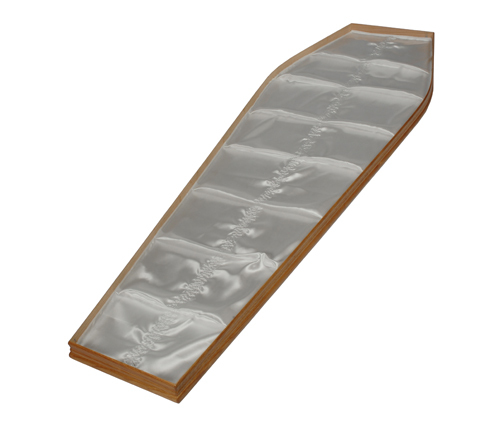 Padded coffin pillow finished in satin for a high quality. White, Pink, Blue, Cream, Navy, Maroon, Lilac, Oyster, Peach, Red, Silver/Grey, Mint Green and Bottle Green.